Identification: The dingo is a medium-sized canid with a short, dense coat. The coat is generally ginger in color but can vary between sandy yellow and ginger-red. All color types have irregular light cream-colored markings on the throat, inside the leg, on the under belly and under the tail. 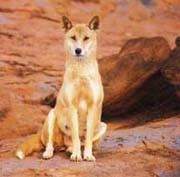 On occasion, dingoes have been seen with black coats and cream-colored points, similar to Rottweiler markings. Dingoes have a wiry to medium build with long, thin legs, bushy tails, muscular jaws and square muzzles. The ears are large and pointed and lack fur lining the insides. The tail is long and tapered, covered in the slightly bushier hair than the rest of the body. The eyes are almond-shaped and amber-brown in color. The larger canines and carnassial teeth differentiate the dingo from the domestic dog (Canis familiaris familiaris) and dingo-dog hybrids. Differences in skull bones and the patterns of breeding also distinguish the dingoes. Pure dingoes have flatter foreheads and squarer jaw-lines than domestic dogs. Domestic dogs also show no seasonal pattern of breeding whereas dingoes breed only once a year. The average dingo has a head and body length of approximately 72-111 cm, a tail length of 21-36 cm, a shoulder height of 40-65 cm and a weight of 8.6-21.5 kg for males and 8.3-17.0 kg for females. Southeast Asian dingoes of both sexes are smaller than dingoes found in Australia with males distinctly larger than females in both regions. Site and Date of Introduction: Early theories suggested dingoes came to Australia as companions the Aborigines approximately 50,000 years ago. Recent fossil and archeological evidence now suggests dingoes arrived in Australia about 3,500 years ago. Due to the origin of dingoes in Southeast Asia, it is theorized that dingoes were introduced to Australia by Asian seafarers. Mode(s) of Introduction: Due to the origin of dingoes in Southeast Asia, it is theorized that dingoes were introduced to Australia by Asian seafarers. Reason(s) Why it has Become Established: The Australia Aborigines adopted the Dingo as a companion animal as well as using it to assist with hunting and for warmth on cold nights. During Australia’s colonization animal husbandry became more commonplace. The introduction of livestock, such as sheep, became an easy prey for the dingo. It is thought that the co-operative pack behavior of dingoes gave them an important competitive advantage over the more solitary marsupial carnivores, particularly during Australia's frequent droughts (when game becomes scarce). 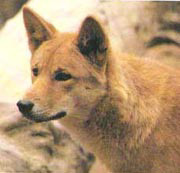 Ecological Role: While the full ecological extent of the dingoes introduction to the Australian landscape has not been quantified, dingoes are thought be responsible for the loss of numerous medium-sized Australian mammals, including species of bandicoots, macropodids, and rat-kangaroos. They are also thought to be responsible for several extinctions of different species of marsupial carnivores, including the Thylacine. Their predator-prey relationship with livestock throughout Australia led to the creation of the great Dingo Fence in the 1880s. The 8,500 km Dingo Fence was designed to keep dingoes out of the southeast part of the continent, which was considered fertile pastureland, and protect the sheep flocks of southern Queensland. Benefit(s): Some researchers suggest that dingoes actually help to maintain populations of small Australian mammals especially European rabbit populations, which have become pests throughout Australia. In many areas of Southeast Asia, dingoes are kept as pets, living with humans and guarding their houses in exchange for food and shelter. Many peoples in Asia will consume the flesh of the dingo as their primary protein source. In Australia, the general public is banned form owning dingoes as pets. Threat(s): Dingoes’ primary threat is humans. Within the Dingo Fence boundaries, dingoes are considered vermin with many territories offering bounties of up to $500 for their hide. Farmers allege that dingoes seek out the sheep for food, though research has shown that dingoes only seek out domestic food sources when natural food sources are scarce. Crocodiles and other canid species, such as jackals and domestic dogs, also threaten dingoes. Dingoes are territorial animals and therefore threatened by other dingoes from other packs while dingo pups are threatened by large birds of prey. Dingoes are also threatened by interbreeding with domestic dog species, which leads to the creation of animals that may not be as wary of man and thus more prone to prey on livestock. In addition, this interbreeding threatens the genetic purity of the animal. Control Level Diagnosis: Medium Priority; The Federal government of Australia deems the Australian dingo as Native fauna. It is protected in all National Parks, World Heritage areas, Aboriginal reserves, and the Australian Capital Territory. Despite the protections in place, the dingo has been declared a pest throughout much of its remaining Australian landscape. Without conservation measures to protect the pure genetic structure of the dingo, a near-native species of Australia could be lost. It is also a species that has an emotional connection with the many of the native cultures. In addition, due to the introduction of other small mammalian species into the Australian landscape, losing the Dingo could mean a proliferation of these already invasive species. Finally, the interbreeding of the dingo with other domestic dogs could lead to an increase in attacks on livestock. Control Method: There needs to be increased education from Australian preservation societies to protect and educate the public about the dingo. These protection societies can also utilize genetic testing to foster, breed and protect purebred dingo lines. Active genetic testing needs be administered to the dingo populations to determine the level of hybridization with domestic dogs that has already taken place. While the Dingo Fence helped to eliminate some of the problems of livestock eradication, many populations of dingoes reside on the “wrong side” of the fence. Dingoes have received bad publicity through the highly publicized disappearance of Azaria Chamberlain. Oakman, B. "The Australian Dingo Conservation Association Inc." (On-line). Accessed November 14, 2005 at http://www.dingoconservation.org/.